Building on the brilliance of Fred Korematsu Speaks Up, the newest installment in the Fighting for Justice series introduces young readers to another real-life champion for civil rights: Bridget "Biddy" Mason, an African American philanthropist, healer, and midwife who was born into slavery. When Biddy arrived in California, where slavery was technically illegal, she was kept captive by her owners and forced to work without pay. But when Biddy learned that she was going to be taken to a slave state, she launched a plan to win her freedom. She refused to be defined by her enslavement, and coauthors Arisa White and Laura Atkins devote much of their narrative to Biddy Mason's later life as a business and civic leader in the fledgling city of Los Angeles. 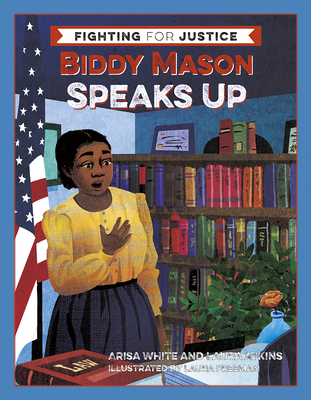 Biddy Mason Speaks Up is an age-appropriate yet unflinching examination of slavery, racism, and community healing in the United States. Each chapter begins with lyrical verse and full-color illustrations that draw readers into the narrative, and is followed by visually engaging sections filled with keyword definitions, historical context, timelines, and primary sources. Throughout the book, the authors pose questions to the reader, such as "How do you see power at work in your community?," making Biddy Mason's story all the more relatable to the present day.